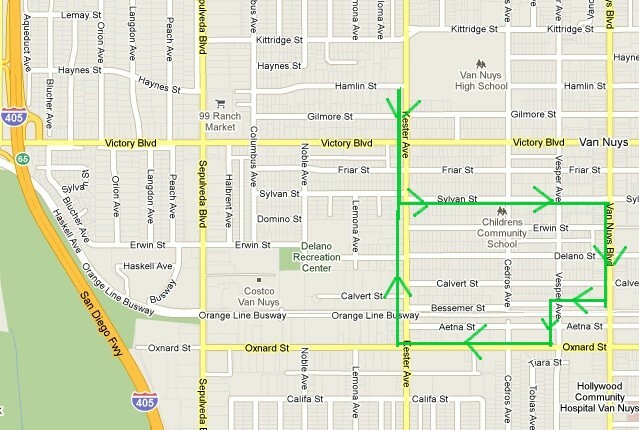 Under the cover of clouds, I walked along Kester, Sylvan, Van Nuys Blvd., Aetna, and Oxnard streets this morning. Kester is well-known as perhaps the filthiest street in Van Nuys, with trash-filled curbs, wrecked vehicles, and yards full of debris and neglect. Slumlord owners and indifferent managers create much of the property abuse. The tenants, amazingly, do not. It is not the fault of a renter if a building fails to repair a damaged roof, or if a mini-mall cannot sweep its curb daily. Sylvan, between Kester and Van Nuys Blvd., is a mixture of older homes, 1950s and 60s apartments, and new construction. Some of the buildings are quite neat and tidy, while others have couches, garbage cans, and discards strewn about. Van Nuys Blvd. is neither broken down or upscale. It is just simply unpleasant. There is nowhere good to eat; nothing fashionable to buy. Cars speed by, on a six-lane street, under the daytime burning sun and nighttime orange glow of the cobra lamps. Most of the stores are for bail, legal services, pot dispensaries and do-it-yourself salvation/damnation churches. A very red-hot dog stand is a bright note on Erwin and VNB right across from the Mall. An apron clad, Asian woman working there, seeing my camera, came outside and motioned me to not photograph the building. Business must be very good there to turn away free publicity. Aetna and Bessemer, two streets that parallel the Busway, are industrial and contain machine shops, car repair and other functions involving grinding, grease and garbage. On Aetna at Vesper, there is an elegant, two-story, Art Deco, 1930s structure that must have served some governmental function seven decades ago. It stands amidst the vast asphalt car lots and waiting braceros. All that is missing from this environment is a plan and the money to remake it. Kandahar, Islamabad and Baghdad stand in front of the line, ahead of Van Nuys, at Uncle Sam’s bank. We have an unresponsive government, led by Tony Cardenas, which lacks imagination, integrity and vision. My buddy’s dad owned that hot dog stand when we went to high school in 1980. It bought him a car and sent him to college. He was not Asian, so it must have changed hands by now.